Vegetarian sandwiches often feel like an afterthought. Scanning a restaurant menu, the veggie option is usually the last on the list and it can often seem like a stack of leftover condiments. But when Bon Appetit’s most recent issue featured an array of delicious looking sandwiches, I took matters into my own hands. I spotted the Green Goddess Tuna Salad sandwich that was begging for a vegetarian make-over. This sandwich can also be made vegan if that’s more your style. 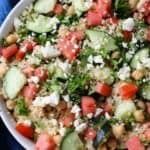 As an added bonus, you can whip up this chickpea salad in advance and then smear it over a few slices of bread when you’re ready for lunch. To sneak in a few extra vegetables, I like adding shredded carrots but if you don’t have any, don’t fret. You could also add a handful of spinach or some alfalfa sprouts if you’re feeling fancy. For the bread, just about any kind will do but I love a hearty whole grain bread. Bonus points if you toast it first so it’s a little bit crispy. Chickpeas are a perfect sandwich filling because 1 cup of chickpeas contains 14g of plant-based protein! It also provides 12g of fiber which means you won’t be hungry an hour later. Plus, they’re friendly on the budget. And just look at that sauce! 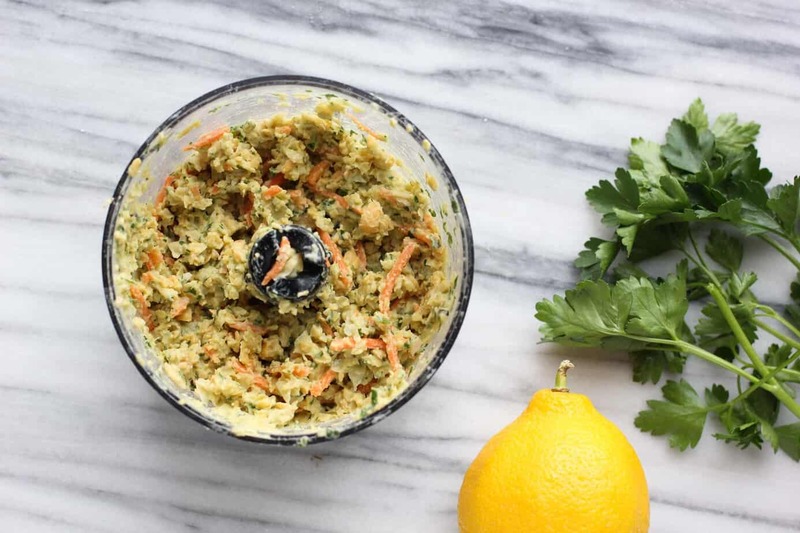 Once you’ve blended the sauce, you simply add the chickpeas and carrots and pulse until chunky. One batch of this salad makes plenty for two but you could make a double batch if you’re the meal-prepping type. It will keep for a couple of days in an airtight container in the fridge. Just be sure to keep it cold since it contains yogurt. 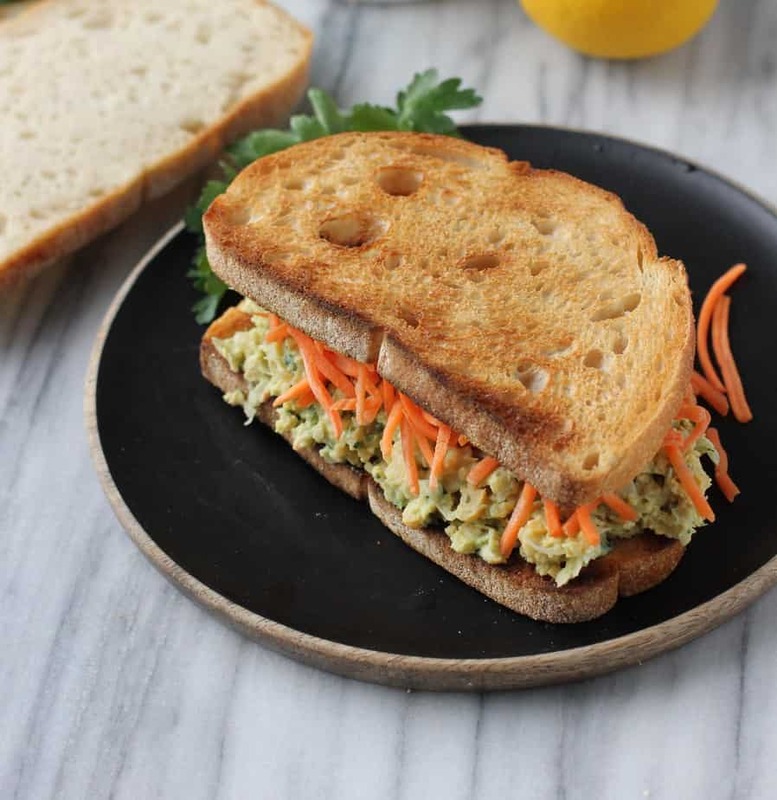 This chickpea salad sandwich is like a veggie version of “tuna” but with extra flavor from the fresh herbs! 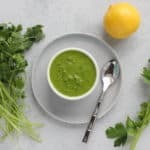 Add the basil, parsley, yogurt, lemon zest, lemon juice, and olive oil in a food processor or blender and blend for 30 seconds or until mostly smooth. Add half the chickpeas and pulse for 10-15 seconds until slightly chunky. Transfer to a bowl and add the rest of the chickpeas. Mash with a fork to combine. Stir in the celery and add salt to taste. 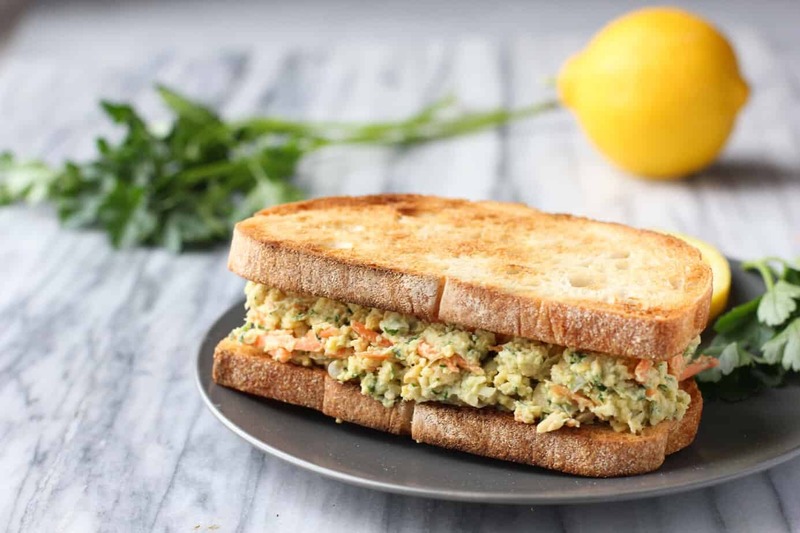 Divide the chickpea salad between two sandwiches and serve immediately. To make this vegan, you can substitute the Greek yogurt for almond milk or coconut milk yogurt, just be sure it’s not sweetened. Add an extra teaspoon of lemon juice to give it more tangy flavor. No basil? Feel free to substitute additional fresh parsley or cilantro. Looking for a lower carb option? Try this in a lettuce wrap! No celery? Feel free to skip it! It adds a nice crunch but it’s not essential. 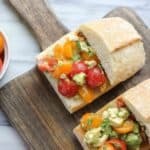 What’s your favorite vegetarian sandwich recipe? I know what you mean about the vegetarian sandwiches. 🙂 Love the changes you made here, and that vegan options! I am extremely fond of sandwiches and am always on a lookout for new varieties. I must try this asap! Mmm, my mouth is watering right now. 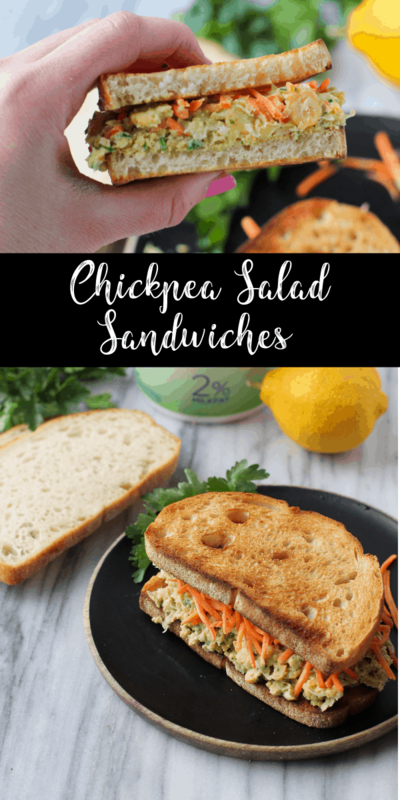 Chickpea is my favorite and I love that these sandwiches keep me going for a while! 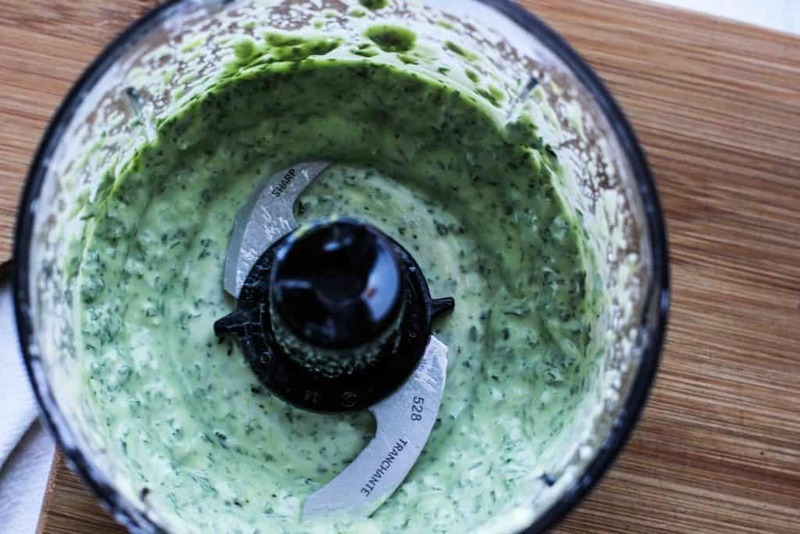 green goddess dressing is such a versatile thing to have on hand…love this quick lunch option! Beautiful blog, Liz! I appreciate the helpful tip about adding an extra teaspoon of lemon juice to the dairy-free plain yogurt to give it more tangy flavor Woo-hoo! I love this! I have to avoid sodium as much as possible, so I love it when I see a recipe like this which can work well even without the salt added. 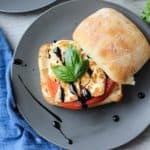 This sandwich looks awesome and so delicious and healthy! Can’t wait to try this for lunch or dinner soon! What a perfect sandwich! I can’t waIt to try it!